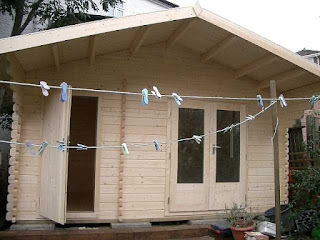 Most of our clients are looking for a log cabin they can use year round. Which means electrical connection and in this case a telephone and network cable also. 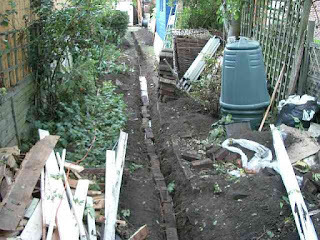 Here we see the trench being back filled. 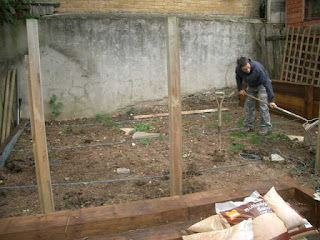 The trench is dug to a depth of at least 450mm and the network and telephone cables are placed in conduit at least 100mm away from the amoured power cable to avoid interference with network signals. Typically 10mm armoured cable is used for power and Cat5e cable for both the telephone and network connection. 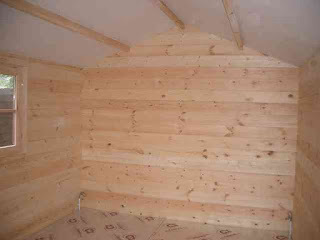 The floor and roof account for 70% of heat loss in your cabin so here we see the first stages of insulating the roof. 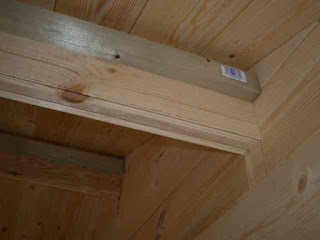 Battens are fixed approximately 65mm away from the ceiling, plasterboard is then fixed to the battens and 50mm high density rockwool slabs are fitted in the gap. 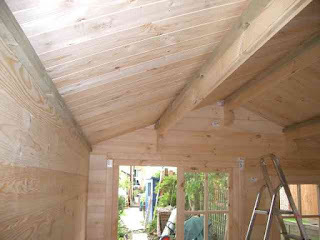 The result is an insulated roof which looks good when painted and makes the most of exposed wood. 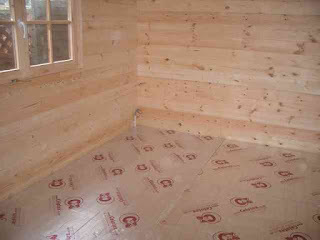 Last but not least it is agood idea to insulate the floor. If you are having laminate or real wood floors the best solution is to lay 50mm Celotex which offer superior insulation qualities compared to standard laminate floor underlay. Often used to line attic rooms it is foil backed both sides and is so good it feels warm to the touch. All that remains is to make your choice of laminate or real wood flooring to go on top! 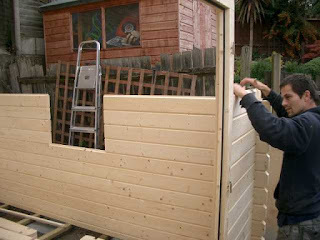 This is quite a narrow site so the client chose a Liverpool cabin 3m wide and 4m deep. 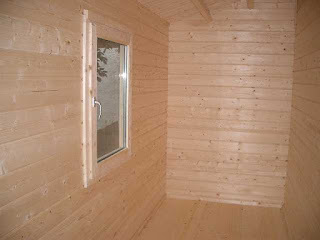 Double glazed with 44mm walls this is a cabin well suited to home office use. 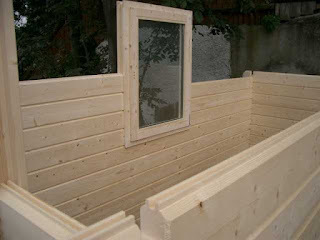 Walls are double tongue and groove and Eurovudas have made improvements in the quality of window and door fittings which are now nearly in the same league as finnforest. Doors and windows now have weatherstrip seal and tilt and turn window mechanisms. The doors have sliding bolts locking at four points along the side of the door similar to patio door locking arrangements. 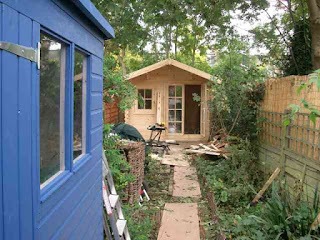 Here you catch a glimpse of the new shed...the old sheds have gone and the log cabin is well on the way to completion. 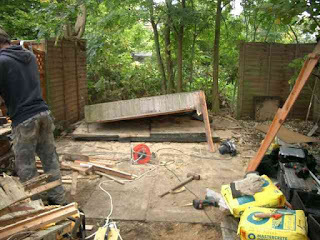 Before we could start this installation we had to clear the site and build the base for a new shed. 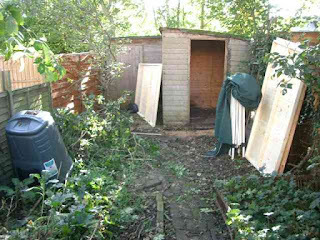 To make room for a new garden office these two sheds had to go. 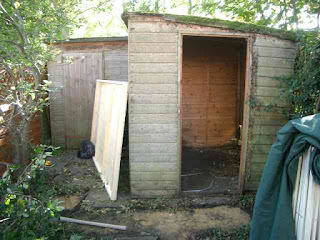 This meant a new shed was required to hold the garden tools. The second shed close to demolition and the un even paving is exposed. 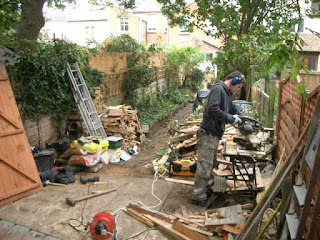 Rather than dumping all the wood our client was keen to have the perpared wood for their open fire throughout the winter. 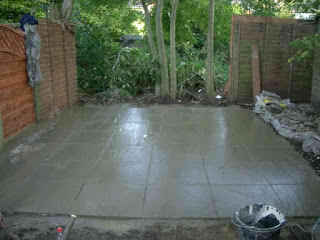 Having lifted the majority of slabs and mixing a mortar base the slabs are repositioned ready for the new log cabin. 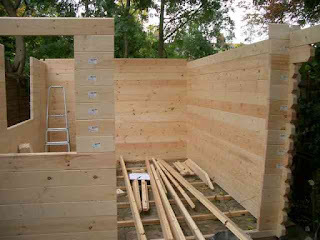 Last weeks installation was a Talo log cabin from finnforest. 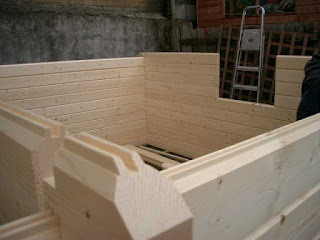 The delivery service was great, the cabin itself is well made and comes with high quality fittings. Tilt and turn windows are double glazed and even the store has a double glazed window with weather strip seals on both the windows and the doors. 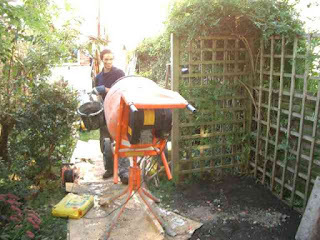 Access on this job was paticularly tricky with everything having to go through the house. 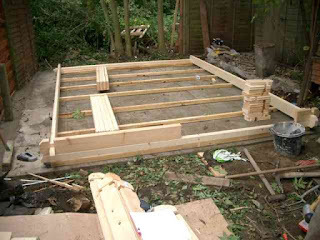 It was with this is mind that we chose to go for paving slabs laid evenly across the footprint of the log cabin. They require less concrete mix but being substantial 600mm square slabs they provide good support on an already compacted site. 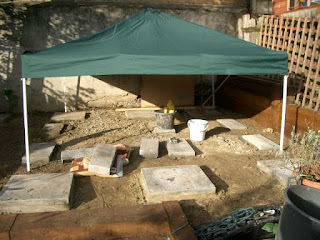 We hired a whacker plate to compact the site then started the process of laying the slabs starting with the highest point and working around the base with each subsequent slab checking for level each time. The results are here for you to see. Click a picture to see an enlarged image. The cabin was due for delivery Friday morning and was there before 9a.m. so when we'd finished our Tesco breakfast at Wembley we were able to start work straight away. 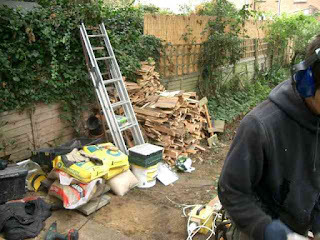 There was the small matter of lifting all the timber through the house including 10 or so steps at the front door! Day two complete and we had the tongue and groove on the roof. Day three was for floors, skirting, bitumen tiles, finishing trim and door adjustment and lock fitting. The french doors can be adjusted for alignment with an allen key in three different planes. 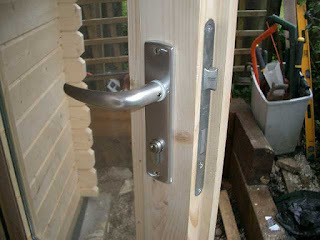 Locks and window fittings are of the highest standard. And here you see the results. Another log cabin in the bag. 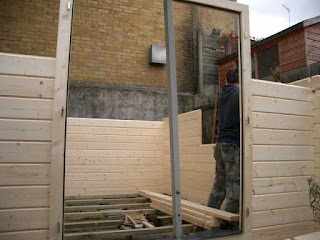 If you are intested in our services view our log cabin installation site.